Come and play one of the best courses in the whole of Queensland. Bargara Golf Club offers the opportunity to play both Competition and social golf throughout each and every week. Our Proshop offers a professional service including lessons and club fitting with our Club Professional Phil Curd and all golf accessories in our Proshop manned by our helpful and friendly staff. Electronic cart users must have a drivers licence. The Bargara on Course Golf Shop is part of a national buying group which guarantees consumers the best brands at the best prices. At Bargara we professionally fit all of our sets we sell and we stock a full range of all types of Golfing Equipment. Join our On Course Club (free) and receive monthly specials and discounts every time you purchase. Stop by the Bargara Golf Club On Course Pro Shop and see the selection and quality of equipment and clothing we have in store. All golf lessons are available by appointment. Bargara Golf Club has excellent practice facilities with a Practice Putting Green, Chipping and Bunker Green and Driving Range. Bargara On Course Golf Shop has a new state of the art fitting centre. The fitting centre, which is situated at the back of the driving range, contains a computerized club fitting and coaching facility. All leading brand fitting systems are kept in stock and our professionally trained fitters, Phil and Jordan, guarantee you an enjoyable experience. Fitting sessions are by appointment only and can be made by phoning the Pro Shop on (07) 4159 2257. Golf Club professional Phil Curd has over 30 years experience playing and coaching the game of golf. Bargara Golf Club has terrific practice and coaching facilities available for both club members and the general public. Phil offers private and group lessons for all parts of your game as individual lessons or packages, either on the driving range or as a video analysis lesson. Coaching is available to players of all levels whether you are a beginner or a single figure handicapper. For more details contact the Pro Shop on (07) 4159 2257. 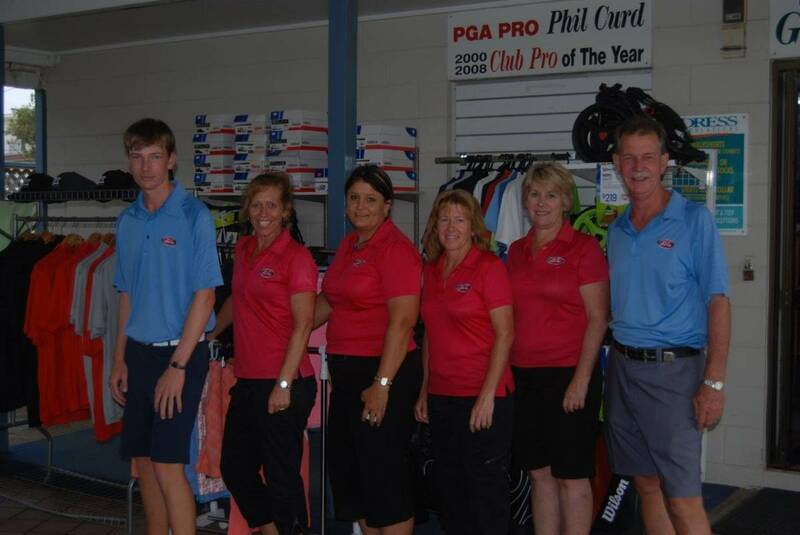 Our Club Professional Phil Curd has been with Bargara Golf Club since 1998. He has been voted Club Pro of the year twice in 2000 and 2008 and in 2009 coached the WPGA US Open Winner Eu Hee Ji. Beside Phil and Janice, our friendly and helpful Proshop staff are ready to assist you with any golfing enquiry you may have, whether you are a member or a visitor.